The table saw is probably the most widely-used woodworking machine in the woodshop. Statistically, it is also likely the most dangerous, as more debilitating injuries seem to be a result of using the table saw than any other woodworking power tool. When using power tools, wearing the appropriate safety equipment should be considered mandatory. 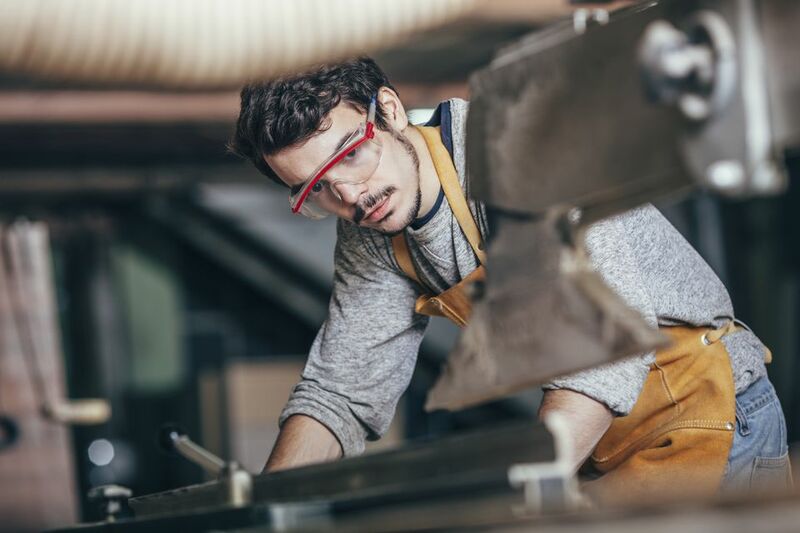 The woodworker should always wear safety glasses and hearing protection, but appropriate clothing should also be considered. Loose fitting clothing, neckties, and jewelry are all hazards to avoid when using a table saw. When using a table saw, keep the table and surround area clear of stock, cutoffs and excess sawdust. Any of these can get in the way or impair the woodworker's ability to make safe, clean cuts. A loose piece of stock could become a projectile if it contacts a moving blade. Before beginning any table saw task, always check the safety features of your table saw to make certain that they're set and functioning properly. The saw blade guard, riving knife, and anti-kickback pawls are designed to protect the woodworker and should be adjusted properly before the power is turned on. When cutting large pieces of stock, such as a full sheet of plywood, position an outfeed table or stand to help support the stock. Using these helpers will make the pieces being cut more stable, and the cut easier to complete. Before changing the blade or making any other internal adjustments on the table saw, the woodworker should always disconnect the power to the saw. This will eliminate the possibility that the saw could be inadvertently turned on while the table saw is being worked on. When preparing to start the saw, the woodworker should check to be certain that the blade is spinning freely, and not engaged in the stock. Once the motor is turned on, the blade should be allowed to reach full speed before beginning the cut. When standing at the table saw, the woodworker should maintain a good, solid stance with a wide base to keep a good balance. Additionally, one should not stand directly in front of the blade, so if a kickback should occur, the stock will not kick back into the body but will slide past the operator's midsection. The operator should never reach or make any fence or blade adjustments while the blade is still moving. Instead, wait until the blade comes to a full stop before reaching or making any adjustments. When using a table saw, the proper zero-clearance blade inserts should always be used. When using a stacked dado blade, a proper insert should also be used. Without a blade insert, a piece of stock could fall into the saw cabinet and become a projectile. When using a table saw, the woodworker should never attempt a free-hand cut. Instead, use the fence or miter gauge to guide the stock. However, keep in mind that the fence and miter gauge should never be used together, as the end grain of a piece of stock can bind against the fence. Before beginning any cut, the woodworker should visually check the board being cut for any foreign objects such as a screw, nail, staple or even a loose knot in the wood. Any of these can come loose and become a dangerous projectile if it comes in contact with a spinning blade. A specially-designed metal detector is great for checking for hidden fasteners in stock, particularly when working with the recycled material. When the board being cut has less than about six inches width of stock away from the blade, a push stick should be used to help push the board through the blade. This will help keep the woodworker's fingers safely away from the blade. Proper push sticks can be built in the shop or purchased at any fine woodworking supplier. Research table saw reviews on Consumer Search.